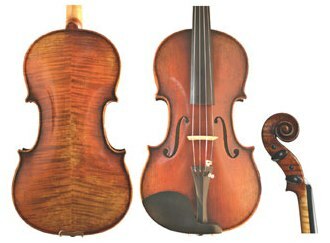 The Eastman Master Series violins are offered in full antiqued finish. These hand made, hand finished instruments offer a high level of workmanship and produce a powerful and robust tone. Hand carved highly figured maple and spruce with inlaid purfling. Hand applied spirit varnish with antiqued finish. Ebony fingerboard with matching chinrest. Fitted Despiau bridge.